The fifth book in the Senior Detective John Bowers series lands us at the scene of a tragic carjacking to find a young mother shot dead in her parked car. Homicide cops in Central Precinct catch a case which looks like a carjacking. There's a young mother slumped behind the wheel with a bloody hole in her head. But without a weapon, no brass, no prints, it's not going to be an easy collar. But when the full forensics team shows up and examines the evidence, it turns out to be something it isn't supposed to be. This is a premeditated murder with the killer trying to throw the cops off the track. The homicide team has to follow the muddy tracks their killer left behind. But there isn't much to follow. Very little forensic evidence to work with means they have to hit the streets and look for answers the old fashioned way. Their first job is to convince the Central Precinct Commander that the murder is not a carjacking and is not even what it seems to be as a random crime. This is a capital murder for profit, and Bowers and Raye can make their case through strong, circumstantial arguments. But the Commander and the DA demand they come up with strong forensics to convince a jury to convict. In the middle of a frustrating investigation, a carjacking occurs across town with a dead attorney of note the victim. Now the detectives are called off their main case and tasked with solving the carjacking case. It takes a while before they can persuade their betters that the real carjacking has nothing to do with their main case. dots and crosses novels seal the deal with. Readers and cops alike never saw this one coming. It's a reminder that even good cops wear blinders once in a while. "The 5th book in the Bowers series is a case with what look to be easy steps to a closure. But what seems simple isn't. The murder scene is staged to mimic a random carjacking. But the investigative team links forensic evidence to show it's a premeditated murder for profit. Their prime suspect has left few forensic tracks to follow. At the end, we're left just as amazed and stunned as Bowers and his partner who never saw this case surprising everyone." "This time Detective Bowers is on a roll right from the start when he catches what looks like a carjacking. Investigators soon see the scene looks staged, and they start on the trail of a killer who thinks he can outwit the homicide team. We know Bowers won't let that happen. He closes the case, but the twisted ending turns everything upside down. Sometimes even the best cops get things all wrong." Ray Bates procedurals and mysteries reflect a Northwest flavor. Bates' varied background in criminal justice and forensic science includes consultant for Regency-Fox Films, national investigator and lecturer. 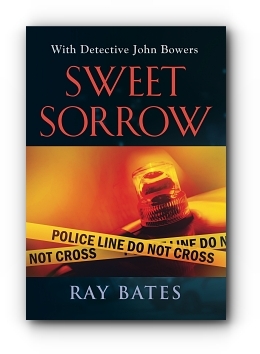 Bates writes a series of contemporary procedurals featuring Portland Central Precinct Homicide Unit and Senior Detective John Bowers.